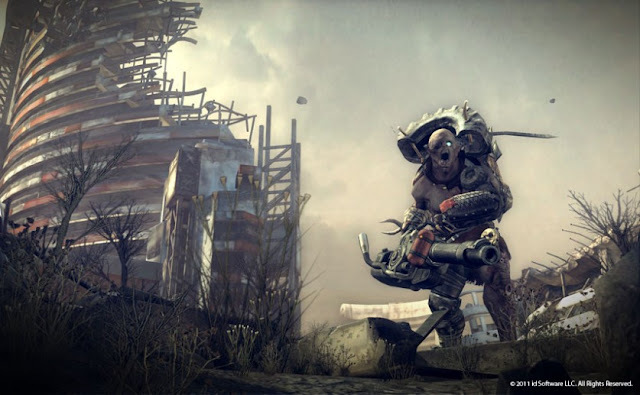 Post-Apocalyptic wastelands, Ark's, sprawling open world gameplay following your sudden waking from a long bout of Cryo Sleep; why does this seem so familiar? Oh, cause in RAGE, the most recent work from famous Austin-based iD developers, you immediately get a sense of deja vu if you've played any of the similar titles in the past two years. 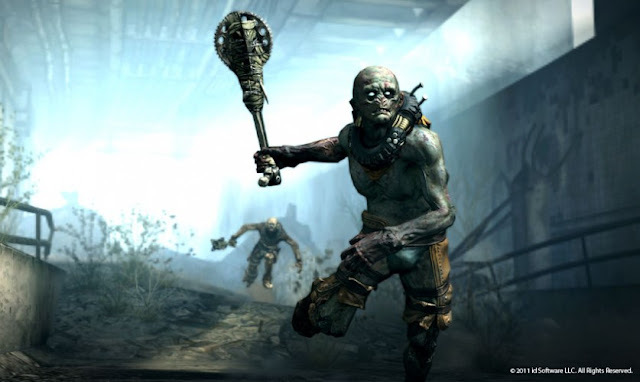 Borderlands, Fallout 3, heck even the recently released Dead Island "feels" the same. The problem was, i enjoyed those games more than this. That's not to say RAGE is bad. On the contrary, RAGE does alot of the same things done before it, and does them well. But for someone who's sunk alot of time into the aforementioned titles, I can't help but feel like I'm starting a "new game+", without the plus. RAGE suffers from a case of the "Summer Blockbuster Duplication Syndrome" (I just made this up), but this is when Hollywood likes to take one "themed" disaster movie, and make not 1, but two independant movies. One Always does better than the other. We've seen this with Armegeddon/Deep Impact, A Bugs Life/ANTZ, and even Dante's Peak/Volcano. I think RAGE, if it had come out before some of these titles, would've been a game changer, but there just feels like too little innovation here. Lets talk about the story. So, an asteroid is headed towards earth, and in the opening sequence, you see someone being cryogenically frozen, while some transmission occurs that they will be going underground. We're to assume that those that are chosen are frozen, placed undergound until a better time after the asteroid hits. Of course, you wake hundreds of years later, all alone. Venturing out of your "vault" you're immediately hit by this vastly enormous land that's clearly in decay. Within minutes you'll encounter enemies, and an ally (voiced by John Goodman, no less) who will transport you in his buggy to a near-by outpost. From here, you'll be given a series of "quests" that you "agree" to (or not, does anyone ever NOT agree? If so, what would you do? Just walk around?). As with most of the open-world games, you'll take on a few story-driven quests in the beginning to lay some ground work. It's in these first few missions, you're getting your bearings, and there are a few tutorials slyly part of the missions. You generally can't tell much about the full game during this time. Soon you'll visit enemy territory, go into their lairs, kill, (be killed), and explore more of the world. You'll also meet a few new NPC's as well, find supplies, locate a missing ally, and locate parts to build your first buggy. After all of this, you are basically asked to leave the village, and you will explore more. 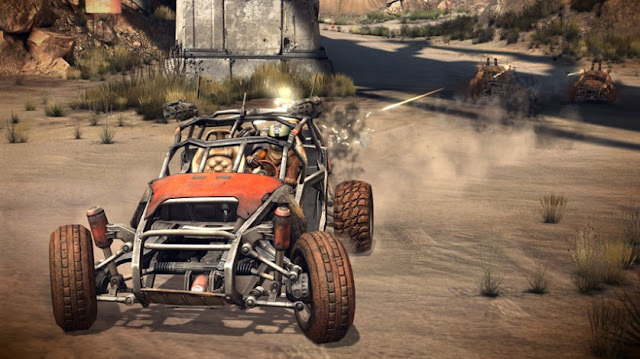 The opening part of the game (all above included) serves as a training ground, you'll learn how to use weapons, drive vehicles, use the defibrillator, and more. You'll notice some pop-in/texture draw that occurs, this looks like a deliberate decision, as it appears to happen on all consoles and on the PC version, probably to help with the iD Tech 5 engine run at a buttery smooth 60 fps. After a while of playing, however, you won't really notice it and instead will just enjoy the detailed environments. 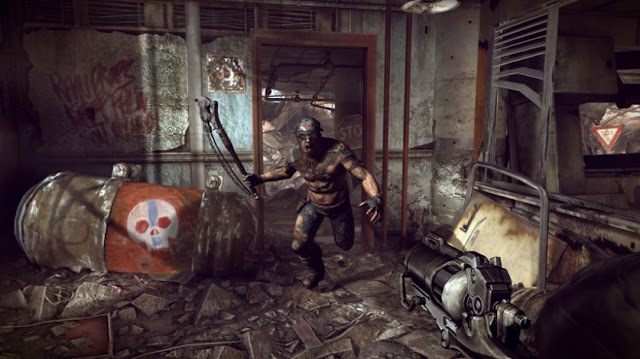 The game and surrounding wasteland is quite a sight to see. Gunplay is similar to any recent shooter, but the real draw here is the behavior of the enemies. You won't find enemies who just walk out blindly into your line of fire, but rather enemies who jump out of the way, and varying their routes to you. You'll need to quickly change your gamestyle in order to survive. Racing/Driving is actually pretty fun, the controls are really tight, and responsive, a must for any type of racing (if it was just getting around town a'la Borderlands or Dead Island, the driving mechanic isn't quite as imperative); but here it does handle much better. 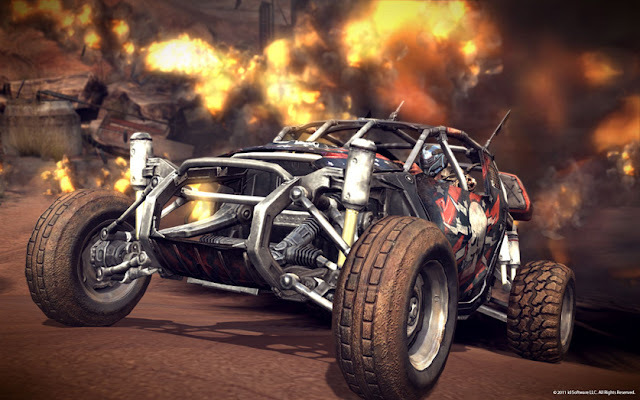 Multiplayer is non-existant except for one Racing/Battle in the vein of Twisted Metal (but really stripped down) and a story-driven co-op experience outside of the main game. Overall, Mashbuttons.com gives RAGE an 8 out of 10. It would easily have gotten an extra point had it come out a year ago. But I think the best thing to be said here, is that iD likely realizes it has a potential new franchise here, and if they can turn out a sequel in the next two years (or debut on next generation systems), they could really update a lot of the gameplay, and mechanics and have a stellar title.